The health of the semiconductor industry is increasingly tied to the health of the worldwide economy. 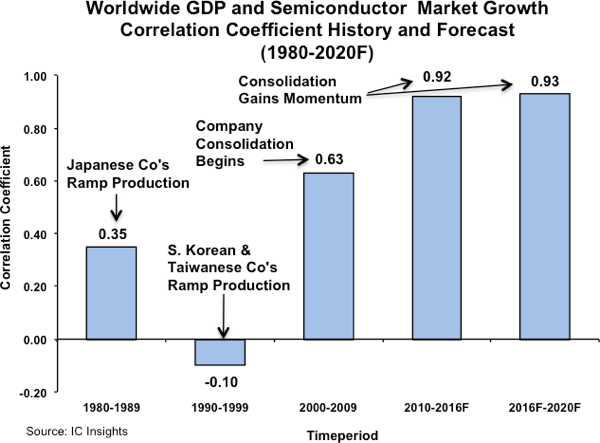 Rarely can there be strong semiconductor market growth without at least “good” worldwide economic growth to support it. Consequently, IC Insights expects annual global semiconductor market growth rates to continue to closely track the performance of worldwide GDP growth (Figure 1). In its upcoming Mid-Year Update to The McClean Report 2016 (to be released at the end of July), IC Insights forecasts 2016 global GDP growth of only 2.3%, which is below the 2.5% level that is considered to be the global recession threshold. In many areas of the world, local economies have slowed. China, which is the leading market for personal computers, digital TVs, smartphones, new commercial aircraft, and automobiles, is forecast to continue to lose economic momentum in 2016. Its GDP is forecast to increase 6.6% this year, which continues a slide in that country’s annual GDP growth rate that started in 2010 when growth rates exceeded 10%. • Whether the U.K. will come apart itself. There are rumblings about Scotland breaking away from being a part of the U.K. in order for it to remain as part of the EU. • What trade deals will be made by the U.K. if it does leave the EU? As part of its exit from the EU, the U.K. will need to establish numerous new trade deals with the EU. There is tremendous uncertainty regarding whether these deals would have a positive or negative effect on the U.K. economy. • Will other countries follow the U.K. and depart from the EU? Anxiety persists over whether the EU will fall apart as other countries attempt their own exit. Some countries mentioned as possibly following the U.K. out of the EU include the Netherlands (Nexit), France (Frexit), Italy, Austria, and Sweden (Swexit). The other major “culprit” dragging down semiconductor industry growth this year is the very weak DRAM market. At $45.0 billion, the DRAM market was the largest single product category in the semiconductor industry in 2015. IC Insights forecasts that the DRAM market will register a 19% drop of $8.5 billion this year to $36.5 billion. The DRAM market alone is forecast to shave three percentage points off of total semiconductor market growth this year. Semiconductor market growth excluding DRAM is forecast to be +2%. Most of the DRAM market decline expected for this year is due to a rapid decline in DRAM pricing over the past 18 months. For 2016, the average price for a DRAM device is forecast to drop to $2.55, a steep 16% decline as compared to 2015’s DRAM ASP of $3.03. Further trends and analysis relating to semiconductor market forecasts through 2020 will be covered in the 250-plus-page Mid-Year Update to the 2016 edition of The McClean Report. To review additional information about IC Insights’ new and existing market research reports and services please visit: www.icinsights.com.